or, I'm not familiar with the Benko gambit. For some reason, friend Warren mentioned the Lewis chessmen to me, a group of 12th-century chess pieces carved in walrus ivory. They were discovered in 1831 on the Isle of Lewis in the Outer Hebrides in Scotland. They represent one of the few complete, surviving medieval chess sets—quite a find. He mentioned this the other day, thus guaranteeing that I would spend the rest of the day hunting for an answer to the age-old question…"Hmmm, is there a typical Neapolitan chess set, the way there are typical Neapolitan playing cards?" Chess pieces are intriguing. They can be generic or themed. Generic are the ones where the two sides have the same pieces and differ only in color. Beyond the standard amorphous chess pieces that you know even if you don’t play, there is a glorious parade of such pieces available. The kings and queens, the bishops, knights, rooks and pawns may be based on Etruscan or medieval themes or on Greek, Roman and Egyptian mythology; they may be Muppets, the Simpsons, Sumo wrestlers, characters from Harry Potter, the crew from Star Trek or countless other TV shows. There are pieces made from auto engine and computer parts, and insects in amber; there is even a set in which all the pieces are shot glasses filled with the intoxicant of choice and you are required to drink the contents of each piece you take! (On a related note, there is a marijuana chess set that describes itself as "totally awesome, dude." Whose move is it?) The list is really endless. Some of them may even be related to Naples or southern Italy if you take your history in big bites; for example, there is a set of figures based on Spartacus (said to have perished in the Castelcivita cave in Cilento) and one on the Hautevilles (the Normans, the first rulers of the Kingdom of Sicily, later known as the Kingdom of Naples). The themed pieces are more intense because the sides not only have different colors but different figures, ones that have been in real historical or even philosophical opposition. There is an Angels vs. Demons chess set, and there is one called Good & Evil in which Hitler is the white king (what?! ), but only because Martin Luther King is the black king. (Get it? and he has Donatella Versace —really— and Gandhi on his side, so watch out, Adolf!). There's a Columbus set where Chris is the king and Isabella his queen, and they are up against the New World figures of king Montezuma and an Inca Sun Virgin as queen. A Crusader set I saw pits Richard the Lionheart against Saladin (that game is still going on, I’m afraid). Historical battles have sides and lend themselves well to transformation into themed chess pieces: Waterloo, Gettysburg, Trafalgar, Cullodin, Hastings, Lepanto, Little Big Horn, Pearl Harbor, etc. They all have their chess sets with appropriately themed combatants. Here is where I found the only example of chess pieces relevant to the modern history of Naples (photo, above, right). It was called "Borboni vs. Savoia” (sic—but the correct plural is Borbone, not Borboni. Checkmate!) and is self-described as a set in “alabaster and resin, hand-painted, representing the battle of the Savoys against the Bourbons that led to the unity of Italy.” The figures are vaguely identifiable as north (Savoy) or south (Bourbon) by military uniforms or flags. I did not find a set of Neapolitan pieces where Ferdinand IV was the king, Caroline the queen, both protected by a whole Neapolitan row of scugnizzi as pawns. The Maschio Angioino would make a great pair of rooks, the votive spires of Gesù Nuovo and S. Domenico Maggiore would be worthy bishops. Maybe the "Russian Horses" at the Royal Palace could be the knights, or, as I call them, the "horsies." More research is needed. Chess pieces can be made of almost anything from common wood to very endangered and expensive red coral. Truly luxurious sets can have ivory pieces on one side and coral on the other. Naples was and remains a center of Mediterranean coral and has produced such chess pieces. Chess boards, themselves, seem secondary, but they, too, present a great variety. You will find intarsio (wood inlay) examples from Sorrento, one of the great centers of Italian woodworking. Also, both board and pieces may be made from stone —marble, natural stone, onyx. (Onyx, by the way, is a banded variety of chalcedony, itself a cryptocrystalline form of silica. Checkmate, again!) 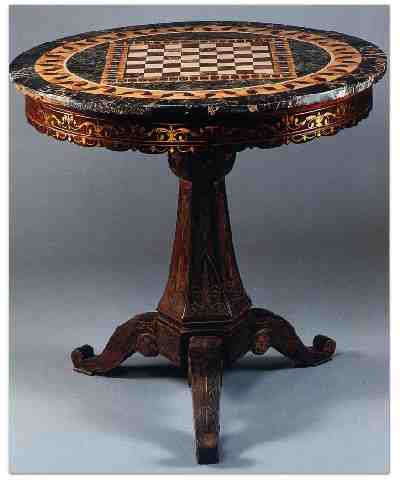 The chess board (a chess table, really) in the image at the top of the page is anything but secondary; it is one of the most remarkable boards ever produced in Naples. It is in the possession of the Filangieri collection and was a gift from the private collection formerly in the Villa Livia. The artisan is not identified, but it is a fine example from the 1700s. The circular shape was unusual at the time; normally, board games were played on a rectangular surface. The main surface is spectacular, displaying wood inlay with what is called “threaded veneer”—meaning that the thin slices of wood typically glued onto the core panel in the technique of intarsio have been threaded with metal, in this case, brass. The wood is mainly mahogany and the circular base of the main platform is polychrome marble and jasper. The table is 80 cm/31.5 inches high and 87 cm/34 inches in diameter. If you bring your simple department store plastic chess pieces to a game on this table, pal, you are what we call a real wood-pusher. From one wood-pusher to another.